Sharpless 142, or SH2-142, is an emission nebula in the constellation Cepheus. 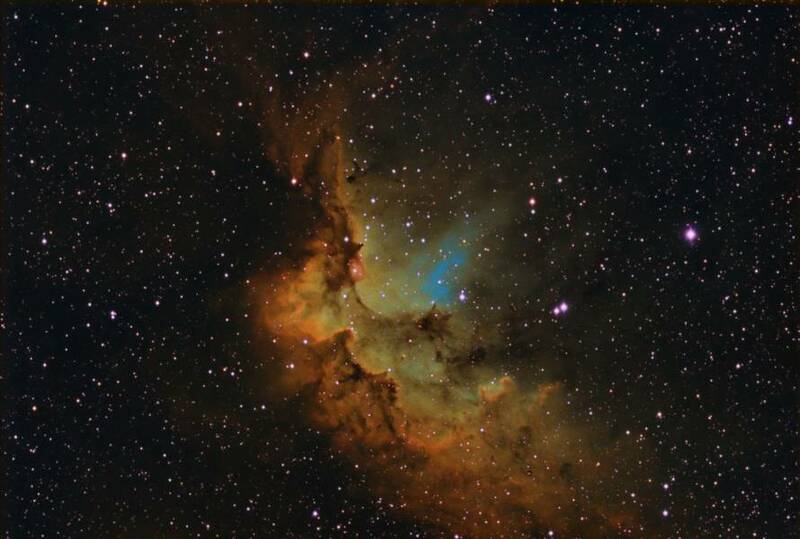 It is often referred to as NGC 7380, though that designation actually refers to an open cluster of stars embedded within the nebula. This is yet another star forming region within the Milky Way lying around 7,000 light-years away. Radiation from young, energetic stars born within the nebula is causing the gas to glow like a neon sign. Intense stellar winds are also shaping the nebula, giving it an interesting shape that has been dubbed the Wizard Nebula. So where’s the Wizard? He’s facing right, and a spell is blowing out from his mouth like a bubble. The dark dust lanes above the bubble form his pointed hat, and the flowing clouds of gas and dust below form his robe and his gesturing arms. Colors mapped using the "Hubble Palette": SII data mapped to Red, H-alpha data to Green, and OIII to Blue. Equipment Used: Takahashi TOA-130F on an Astro-Physics AP1200GTO mount. SBIG ST-10XME camera with CF-8 (5-position) filter wheel and Astrodon Narrowband filters.